Halloween Is Time For Blessing! If You Blog, Why Not Give Entrecard A Try? Football: Play Hard or Fight Hard? Is This Any Way To Treat Our Guests? Miracle Monday: "The Man Who Wouldn't Budge"
Did You Ever Have This Yard Problem? I like to watch “Undercover Boss” because it shows a variety of jobs performed by people of different companies. When I watched the one about the Waste Management company, it showed the nastiest job that I most definitely would never want to do—cleaning porto-potties. YUCK! I can’t even stand to use park restrooms because they usually smell so bad, but porto-potties are even more disgusting. I never really thought about someone having to actually clean them until I watched that show. It showed the CEO of the company going undercover as a new employee and having to learn how to clean the porto-potties at a fairgrounds. Even though he had a machine kind of like a vacuum cleaner that he used to get the waste out, it still looked very bad. The one who was training him kept telling him he had to work faster, that they were behind schedule. I am so glad we can choose our own jobs in this country and I do not have to make my living that way! Please check out What Makes Me Mad and What I'm Going To Do About It on My Funny Dad, Harry, another writer's workshop prompt. This post is in response to one of Mama Kat’s Writer’s Workshop prompts that I suggested! I am curious to see who else chose this prompt to post about and what other terrible jobs exist. For more top posts of the week, check out Saturday Samplings. I put porta potty cleaner at the top of MY list, too! I love Undercover Boss as well. I remember that portapotty episode and the man did his job with such an upbeat attitude, I love it. I don't think I could do it though. I like that show too. Porta-potty cleaner has to be in my top 5...yikes! I couldn't do the porta-potty cleaner job either. I gag way too easily! When I was 15 I was a maid in a motel. That wasn't too fun either. Ironically I did my own post about Undercover Boss this week on why I like the show. I remember the Roto Rooter CEO one and that had some funny moments. I personally loved this prompt so thanks for suggesting it. And now that you mention it, I don't even WANT to think about what goes into cleaning those porta-potties. It is bad enough just being in one from time to time. WHOA, I never even realized those things were cleaned. I thought they were thrown into a huge lake of fire after the fair was over. Oh my, that is a horrible job! I've seen this show, and the thing I take away from it is that the CEO's see what it's like in the "trenches", and actually make changes that benefit the employees. I wouldn't want to do some of those jobs Mike Rowe does on "Dirty Jobs". I saw that episode, too, and I agree--too nasty for me :) I love that show. I have that show on my to-watch list but haven't had the chance to DVR yet. 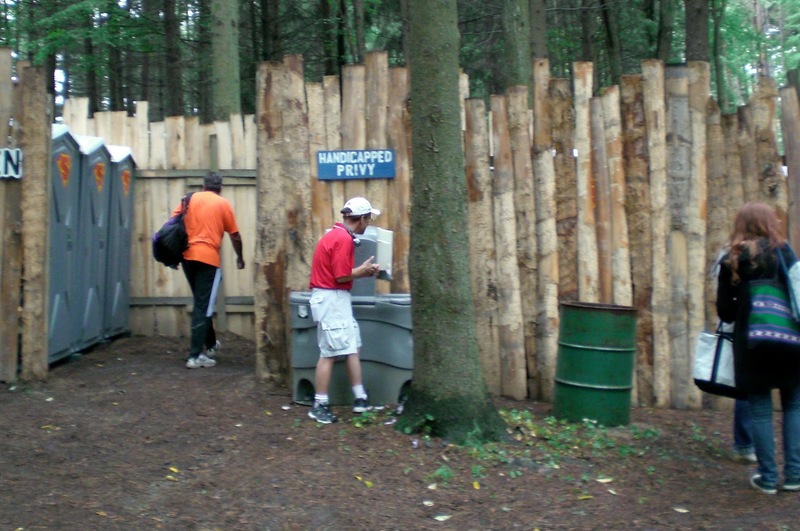 I agree cleaning port-a-potties would be the absolute worse. UGH. Gives me chills to even think about it. You were right, we did choose something similar on worst jobs! I wouldn't have even thought about my choice had I not had that conversation in the airport with that woman. That show you mentioned sounds like a very humbling one! That job would require an oxygen mask and a serious peg on the nose! that would be a bad job... eewww. hey there fellow Undercover Boss fan! Yep- I abso-friggin-lutely LOVE that show. And yes, cleaning out Johnny-on-the-Spots and septic tanks is not my dream job. But my 'real'job is really not much better--- bodily fluids from all orifices... and I really like my job? Confirmation of sanity not required here! Thanks for the link up on Saturday for my Cancer post... and glad things are looking up for you. Ohh, that's a good one! I've always wondered how they clean one of those thing. I can barely bring myself to use a porto-potty, let alone clean one! Yuck! Can you imagine snuggling up to your honey at night smelling like a surage plane...eeeewwwww!!! yuck!! O.M.G. that's a horrible job! I would certainly never want to do it either! Ahhh...I'll never look at the porto-potty at the soccer field the same again! !